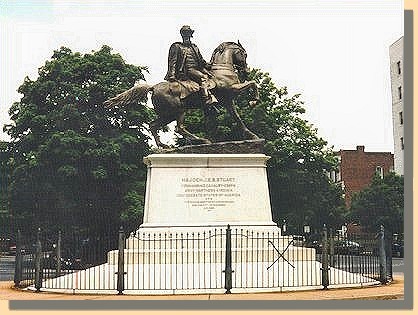 On Monument Avenue in Richmond, there are dozens of statues of confederate war heroes on their horses. (The old idea whether the horse and one or both legs raised depends on whether the hero was wounded or killed in battle is a myth). These statues are uncannily realistic, from the snarl on the horse’s face and the fire in its eyes to the muscles that ripple under its skin. Every detail of the battle gear and uniform of the honored soldier is faithfully reproduced. In fact, sometimes there is only one difference between the statue and the real thing. The statue is not alive! No matter how perfect the form and faithful the likeness, a stone horse is just not the same as a living one. My religious tribe talks a lot about restoration. We came from a back to the Bible frontier movement variously known as “The Restoration Movement” or “The Stone-Campbell Movement.” Believers were prevented from worshiping together because of their various denominational creeds and traditions. A "closed communion" in which one had to prove that he or she was a member in good standing of a particular church before being allowed to the Lord's table is one way this division was seen. The genius of Restoration was the desire to set aside human creeds and traditions to focus only on scripture so that the barriers to unity would cease to function. Paul seemed to think that Jesus was interested in tearing down walls of separation (Eph 2:14). If we could just go back and just be Christians only, the divisions caused by human traditions would cease to have hold. So we set about “the Restoration of the Ancient Order.” We wanted to recreate the New Testament church that existed in the book of Acts. The organization, doctrine and worship of the church were fully restored, and thus we became “The New Testament church.” Or simply "the church." By that time, we weren't really all that interested in creating unity among all believers but showing that we were the right church and everyone else... well, was the wrong church. We still talked a lot about the "Restoration Movement," but we pretty much had stopped moving anywhere. Restoration had been completed. Even if you grant that we "restored" the essential organization, worship and doctrinal details of the first century church, that is not the same as restoring the church. The church as it was called to be in the first century was saturated in the unity of the Spirit, the love of Christ and the peace of God. The kingdom of God was about "righteousness, peace and joy in the Holy Spirit" (Rom 14:17). That's not form; that's fire. The church was not about what humans did but about what God had done and was continuing to do. To “restore” a church based on only forms and formats, doctrines and dogmas is to build a statue of a horse that has no life in it, no fire. What makes a church the church is the life that comes from the God we worship, the Savior we serve and the Spirit who fills us both corporately and individually. Without the fire of the first century church, there is no restoration.